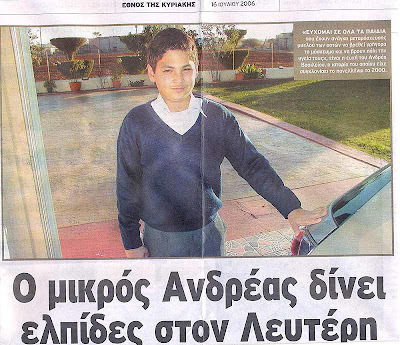 In October of 2000, a family from Limasol, Cyprus, named Vassiliou received the following miracle. In Greece they are well known from the televised requests they made in order to find a donor for their young boy Andrea, who suffered from leukemia. The donor was indeed found and the parents began preparing for their trip to Houston, Texas in the U.S.A where the bone marrow transplant was going to be performed. Meanwhile, they also prayed and begged Jesus Christ to save their boy. Before they left for the U.S.A the parents heard of St. Marina's miracles and they called the monastery of St. Marina located on the island of Andros in Greece to ask for her blessing. The Elder of the monastery, Archimandrite Fr. Cyprianos, promised that he would pray to St. Marina. He also wished the parents for St. Marina to be with Andrea in the operating room, to help him. With Elder Cyprianos' blessing and with strong faith that St. Marina would help indeed, the Vassiliou family went to the U.S.A.
After the necessary pre-operation tests that Andrea had to undergo, he was taken to the operating room. A short time before the operation was to begin, a woman came to see the surgeon who would be operating on Andrea. She said that she was Andrea's doctor and asked to be allowed to observe the operation. The conversation that ensued proved that the woman was indeed a doctor. However, the surgeon replied that 'outside' doctors were not permitted to be present in the operating room and that his medical teams' policy was that no doctor other than those on the team be involved in such delicate operations. The persistence of the woman however, convinced the surgeon to allow her in the operating room. But before, he asked her to leave her coordinates [presumably, credentials] at the administration desk. The unknown doctor did as told and then entered the operating room with the surgeon. During the operation, she gave several directions regarding the progress of the procedure. The operation went well and in the end the surgeon thanked the woman and exited the operating room. Andrea's parents immediately went to inquire about the outcome of the surgery and the surgeon replied that all had gone very well, adding that he could not understand why they had brought Andrea to him when they had such a fine doctor. The parents were surprised and responded that they had not brought any doctor with them. The surgeon insisted, however. He also told them that when he came out of the operating room Andrea's doctor had remained there for a little longer with the rest of the operating team and therefore, she would probably still be around. He recommended that they look for her. The search, however, proved pointless, as the "woman doctor" was nowhere around. The Vassiliou couple then concluded that it must have been a doctor from Greece or Cyprus who had decided to travel to the U.S.A and contribute to the delicate operation. They expressed the wish to know who she was so that they may be able to thank her, and at the surgeon's recommendation they then went to the administration desk to ask for her coordinates. It was with utter surprise that they read that the unknown woman had signed with the name "Marina from Andros". Tears of gratefulness and joy filled their eyes as they recalled that the Elder at the monastery had said to them that he wished Andrea to have St. Marina in the operating room to help him. Andrea's parents shared with the media their joy both for the successful operation and Andrea's recovered health and for the miracle they received. 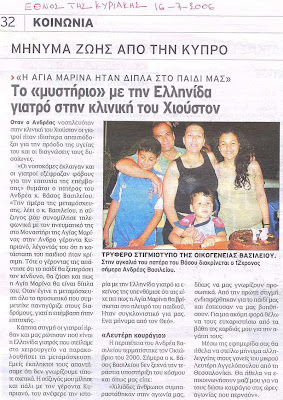 The Vassiliou family made the vow that the entire family will be present at the saint's monastery every year on the saint's feast day (July 17) and Elder Cyprianos reports that the family has been making the annual trip from Limassol to Andros every summer to thank Saint Marina for saving Andrea. The telephone number to St. Marina Monastery on Andros is 2282024074. The father of Andrew, Vasou Vassiliou, is embracing the 12 year old Andrea and is interviewed regarding the miracle. More miracles of St. Marina can be heard here. At this link, below the video that is posted above, there are three audio recording from 2007 of a radio talk show in Greece called “Όπου γης” which can be heard on the site Πειραϊκή Εκκλησία 91,2 FM. The first audio is an interview with Fr. Cherubim who knows the Vassiliou family from Cyprus describing the above miracle of St. Marina for the young boy Andrea. The other two describes a miracle of St. Marina for a woman named Irene Yfanti who was healed of cancer - the first being an account she wrote of her miracle and the second an interview with Irene Yfanti herself. Regarding the miracle of Irene Yfanti, the following took place: The miracle took place in July of 2006. Irene was 28 years old and the mother of a 3 year old. She first visited St. Marina's in Andros in June 2006 after doctors found troubling signs that she may have cancer. Irene's mother had been healed a year earlier of breast cancer during the Divine Liturgy while on a visit to Andros, and made sure to bring her daughter to Elder Cyprianos at St. Marina's in order to get his comforting advice. The Elder said that she would need surgery but to be calm because St. Marina would be with her. She returned to Athens and was checked at St. Savas Hospital. The results were that she had thyroid cancer. Because the cancer was spreading, surgery had to be performed immediately. They travelled again to Andros. Elder Cyprianos told the worried mother: "St. Marina healed you of cancer. Do you think she will abandon your daughter?" He then gave the mother a piece of cotton that had been dipped in holy oil from the miraculous icon of St. Marina and ordered that her daughter keep it on her throughout the surgery. He then gave them some sweets before their departure saying: "When you come back again, you will bring the sweets." They returned to Athens. As the surgery was being performed, the following miracle took place. The surgeon reported afterwards that at times his hand was guided in the surgery and at one point guided him to an infected area previously undetected by the doctors. It was in a well hidden area and he removed that successfully. In fact, the entire surgery was successful and the doctor reported saying that if he had not been guided to find that undetected piece, Irene would have had to undergo a second surgery to remove it. Five hours after the surgery something started to go wrong as she was in recovery. She started to feel a numbness and extreme pain throughout her body. As the symptoms got worse, she was again brought into surgery. While strapped up with tubes, she could hardly move or speak due to the numbness, and worst of all her breath was fading. She wanted to ask the doctors for more oxygen, but she was unable to because of the tubes and the numbness. Eventually Irene felt detached from her body and found herself in a place of extreme darkness, unable to feel any pain. She moved her arms, but the darkness was so great that she could not even see her hands move in front of her face. It was a lonely and hopeless place, she later reported. She wanted to pray for God to help her, but she said she could not pray because it was a place that seemed absent of God's presence. Feeling no real sense of time there, she believed she was there for hours and days on end and came to the conclusion that she died and was likely in hell for her sins. This made her feel very hopeless and in despair, until she heard a voice. She then screamed: "St. Marina, I can breathe!" Upon saying this she felt pulled back into her body. Irene then woke up and saw herself surrounded by about 6-8 doctors and machines all around her. She could breathe normally and felt no pain. She had fully recovered and is today cancer free. The surgeons present told her that she had died and come back - one even said "Irene is risen!"